The bakery smells like sugar today, like the citrusy filling that sticks the cookies together, these circles and clamshells pasted in pairs, drizzled with frosting, covered with sprinkles, then arranged in eye-catching mounds. There are round trays of sweets, too, shiny with sugar-water syrup and studded with nuts. If you prefer savory, there’s a case of mu‘ajanaat, pastries stuffed with spinach or salty white cheese, and wire baskets holding gershala and ka‘ak—pretzel and cracker-like sticks. But I haven’t come to the Oriental Bakery for sweets or snacks. I’ve come to learn more about the bakery’s main product, the thing that first attracted my family to this place: bread. Right now, in early afternoon, the yeasty smell of fresh bread is hardly apparent. Early in the morning though, you’ll see hot rounds of white flatbread falling off the conveyor belt coming from the ceiling. Employees grab the bread, still puffy and pliable, stuff it into plastic bags, and lay it out for sale. The Oriental Bakery has operated in Amman, Jordan, for almost 40 years, on King Hussein Street, a main road leading to al-balad, the city’s old downtown. Zaher Jadallah bought it in April 2017. The middle-aged Palestinian had no background in baking and wasn’t related to the previous owners in any way. But the business attracted him because in the Middle East, bread is one thing that keeps on selling. The idea of bread as na‘ama, Arabic for blessing or grace, is what brought me to talk with Jadallah. People give bread special treatment in Jordan, that much was clear. 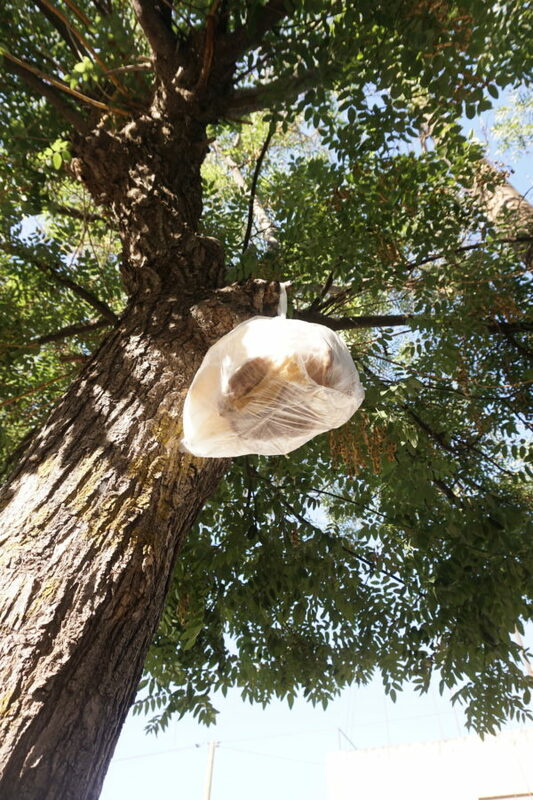 Instead of throwing away stale bread, they hang bags of it from trees near the sidewalk, where it grows green with mold. Snacking pedestrians don’t toss food in the garbage can or on the sidewalk; I’d seen half-eaten cookies left on gateposts, dusty last bites of falafel moldering on walls. I wanted to understand the respect with which people here regard bread. Stale bread hung on a tree branch in Amman. Bread is to the Arab people as rice is to the Chinese, Jadallah told me in his office, a partitioned corner of the bakery. He sat across the desk from me, wearing a polo shirt, his salt and pepper hair neat. I leaned close to hear his soft voice explain bread’s importance. Bread is tied to Arabs by their fathers and grandfathers, he said, and thus foundational in their culture. As an Arabic proverb says: Al-khubz al-haaf bi‘arid al-kataaf. “The meaning is that if I eat just bread, I’ll get strong,” Jadallah explained. “Of course, the words aren’t right. Scientifically, it’s not right.” But when bread was the main food people in this region ate, he said, these sayings helped them convince their children to eat it. All food is a grace from God, Jadallah explained. Caring for it is a religious concept, he believes, but the focus on bread, in particular, is cultural. 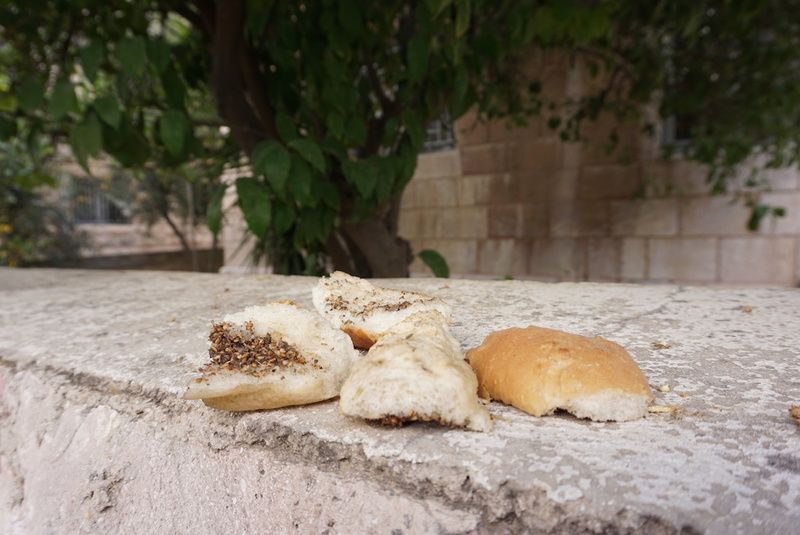 Islam does not command Muslims to pick up bread found in the street, kiss it, and put it on a high place, but these habits, practiced by many Jordanians, developed as an expression of reverence toward bread. 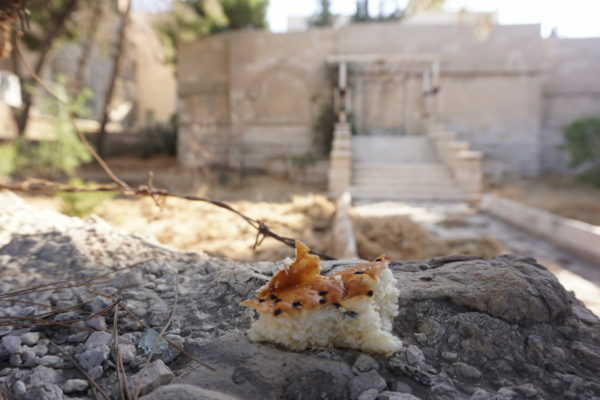 The idea of bread as something holy and worthy of honor is not just Jordanian. Sujud Abdullah Talfah, a Syrian acquaintance of mine, is far from her homeland, but she still treats bread like her mother taught her. After meals, she gathers the scraps of bread and places them in a bag that will never mix with the rest of the garbage. When someone takes the trash to the street, they’ll carefully hang it on the neighborhood dumpster. The regional reverence for bread is religious, Talfah believes. It’s haram—religiously wrong—to throw away bread, because bread is na‘amat Allah, God’s grace or blessing. If you throw away blessings, she said, God will not give you more. Talfah knows a thing or two about bread. Before she and her family fled to Jordan as refugees almost six years ago, she lived in a village in Dar‘aa, Syria’s southernmost province. There, her mother and grandmother daily made shraak, a very thin type of flatbread, often with flour milled from wheat grown on her mother’s 100 dunams of land. As was common in Dar‘aa, they sowed the land with chickpeas, lentils, barley, and wheat. Wheat harvest came in the summer, when the green fields had turned yellow. A bag of bread hanging on the trash collector’s cart. 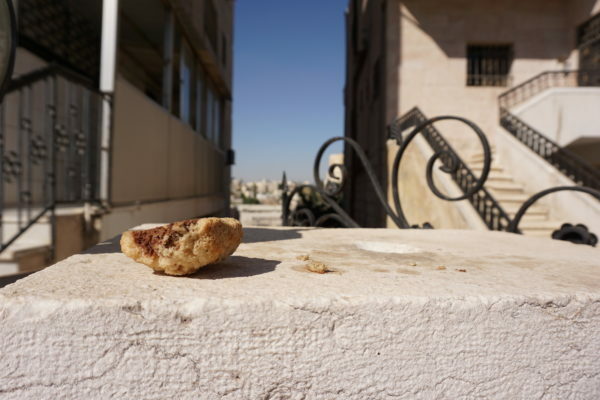 A cookie left on a wall in front of an apartment building in Amman. 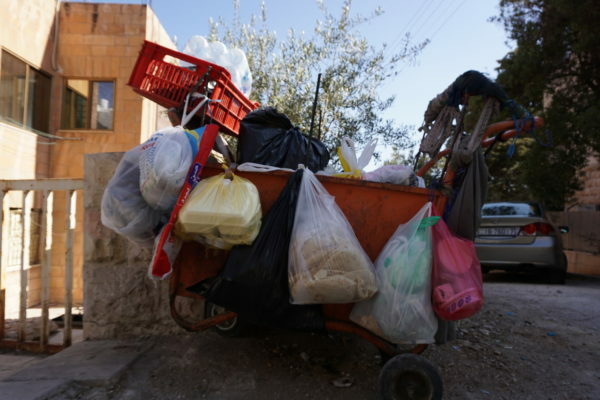 When I asked Talfah about what Syrians do with stale bread, she told me that every family in her village had chickens or pigeons so they could feed them old bread instead of throwing it away. Here in the city, the poor sometimes collect bags of bread to sell it to shepherds or people with birds. This helped explain a veiled woman I’d seen pulling bread from the dumpsters, as well as our neighborhood shepherd, herding his goats through traffic, carrying a bag of bread with him. Talfah now buys bread every day and teaches her four sons to respect it. If one of her boys steps on bread, she scolds him. When they are eating, sitting on a plastic cloth on the floor, she and her husband remind them not to put their feet on bread or make crumbs out of it. Hanna grew up in a village two hours south of Cairo, where her mom raised dozens of ducks and chickens on their roof. What did she feed them? Dried bread, because it was much cheaper than chicken feed. She remembers a special kind of bread they made once a year in her village: meter-long pieces they stacked on a table and covered with a cloth, then ate throughout the winter. Somehow, it didn’t get moldy. In late January 2018, bread nearly doubled in price when the Jordanian government removed significant subsidies on flour, increasing the price of a one-kilo bag of bread from 0.25 Jordanian dinar (JD) to 0.40 JD (approximately $0.56). These increases sparked demonstrations and public outcry on social media. A lot of people saved tons of bread before the prices increased, Hanna said, even filling freezers with it. She heard people say they would use bread more carefully from that point on. A few months after the price hikes, both Talfah and Hanna said the increases hadn’t affected their families much. The women continue to use bread economically, as they did before. Talfah uses stale bread in two Levantine dishes—fattoush,salad with squares of fried bread as garnish, and fattet hummus, a thick, comforting mess of chickpeas, hummus, and bread. And before every meal Hanna asks her husband and daughters how much bread they want with their meal, before pulling it from the freezer. Jordan’s bakeries have struggled since the subsidies were removed. Jadallah said the government used to sell a ton of flour for 55 JD, but now he has to pay 220 per ton, quadruple the subsidized price. And since customers are not even paying twice as much for a bag of bread, it’s the bakeries that are really feeling the loss of profits. A bite of bread left on a wall in front of an abandoned villa. Still, the Oriental Bakery continues to produce about 1,300 kilos of bread every day. Jadallah’s customers are residents of the surrounding neighborhoods, as well as nearby hospitals, hotels, and restaurants. Basic white bread takes less than an hour to make, starting in the giant dough mixer, then moving to a machine that portions the dough into balls and flattens it into rounds. These take a long, zig-zag journey to rise before entering the oven. Then the rounds cool on a conveyor belt high above employees’ heads before dropping into their ready hands. Though they aim to bake just the amount of bread that will sell in a day, the Oriental Bakery always has a little extra. These leftovers go into an empty flour sack and are saved for shepherds who drive into the city, trolling bakeries for cheap feed for their herds. Meanwhile, individuals use leftovers as they wish. Recently, I saw an old man in front of one of Jordan’s parliament buildings. He pulled wads of dry bread from a bag, then wrung it in his hands and sprinkled it on the wall for the birds. This simple task looked like a holy act to me. The act of someone who knew there would be grace for tomorrow, and that there was enough to share today. Heather M. Surls is a contributing writer for EthnoTraveler. Her work has recently appeared in Ruminate, River Teeth, and Culture Keeper. She lives in Amman, Jordan, with her husband and son.